We were BOO'D by Sony Pictures and Walmart! 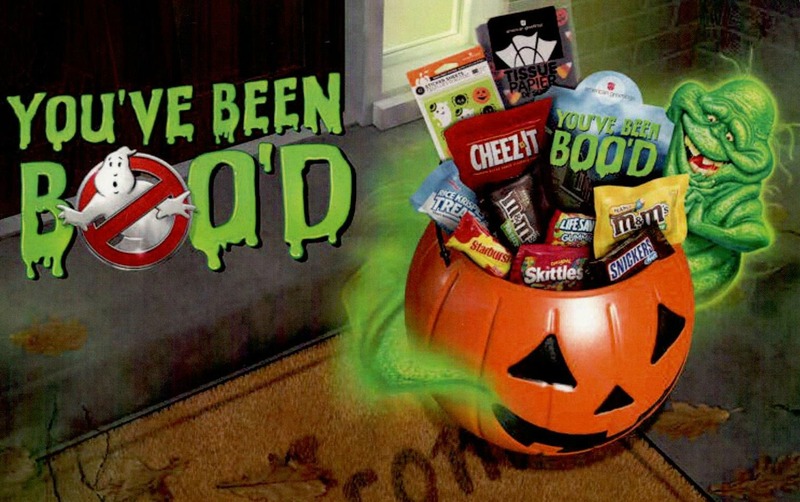 Booing is a Halloween tradition that has been growing in popularity over the last twenty years. Someone mysteriously leaves you a fun treat around Halloween and you have 48 hours to put together your own creative gift of goodies to BOO someone else. Our surprise was finding the new Ghostbusters movie, which was just released today on Blu-ray and DVD, along with an assortment of candy from Walmart waiting for my family by the front door this morning. 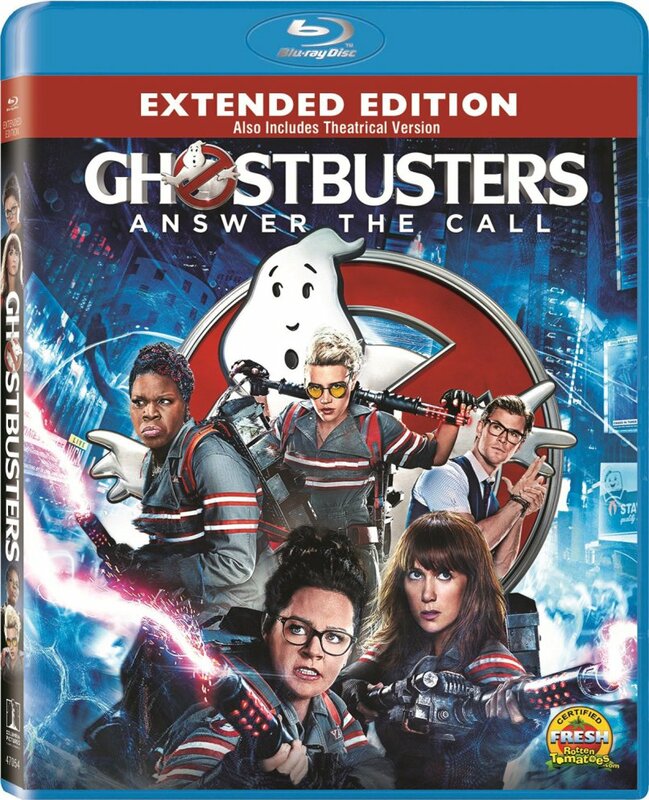 The GHOSTBUSTERS: ANSWER THE CALL -- EXTENDED EDITION on Blu-ray and Digital HD adds more than 15 minutes of never-before-seen film footage to Director Paul Feig's take on the long awaited next installment of the iconic 1980s era supernatural comedy movie franchise. Academy Award nominee Melissa McCarthy (Best Supporting Actress -- Bridesmaids), Kristen Wiig (Bridesmaids), Leslie Jones (Saturday Night Live) and Kate McKinnon (Saturday Night Live) comprise a new Ghostbusters team who must defend Manhattan from mischievous ghouls who descend on Times Square. The EXTENDED EDITION Blu-ray and digital download include both the extended edition and original theatrical version as well as 15 deleted, extended or alternate scenes, gag reels, and filmmaker commentaries. It also provides five featurettes that give fans an inside look into the film's supernatural visual effects, the "making of" the ghosts from the film, an in-depth insight into the team's look and weaponry, as well as the casting of Chris Hemsworth as the Ghostbusters' receptionist. So now that we've been BOO'D it is time for us to #BooItForward. Walmart is a great place to load up on goodies and treats to secretly leave at a friend's front door. They've even dedicated a special Ghostbusters themed area of their website sponsored by American Greetings, Skittles, Snickers, Kellogg's and Sony Pictures that can help people make the perfect BOO kit to support this fast-growing, good spirited tradition. 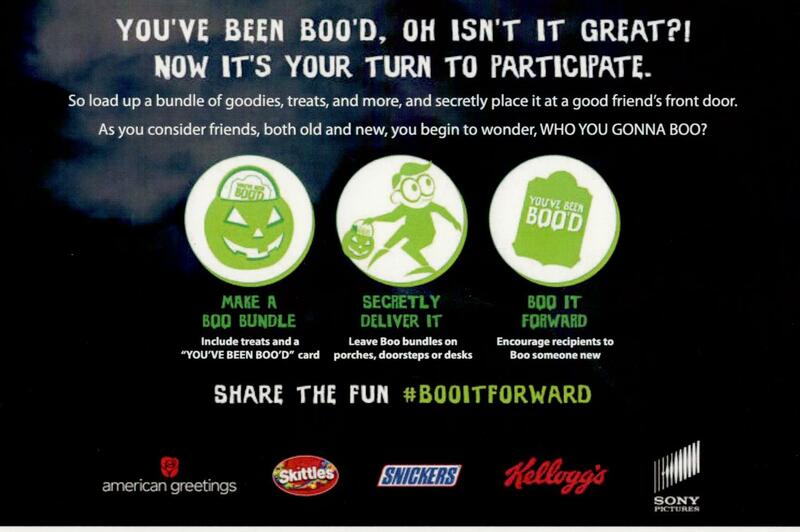 Get on the BOO-wagon and visit Walmart.com/BooItForward. Who are you gonna BOO?! We made sure to Boo It Forward by filling up a jack-o-lantern bucket filled with a variety of Halloween themed trinkets and treats. Under the cover of darkness my son and daughter crept up to the house of one of their classmates quietly leaving the bundle of treats by the door we know she exits each morning for her walk to school. I'm sure someone being BOO'D is going to be the topic everyone is talking about in their class tomorrow morning and my son and daughter are so excited to be a part of this Halloween secret. Enjoy the Halloween season everyone! Share the fun! Boo It Forward!